Bajaj never shies away from talking about who their products are targeted at. 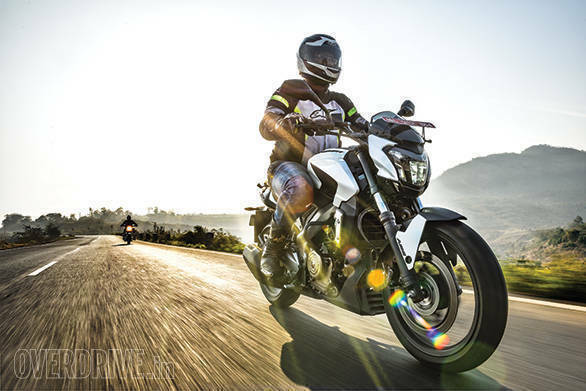 With the Dominar 400, the company has made it clear that it's looking squarely at Royal Enfield's enviable chunk of the 300-500cc market space. Naturally though, the Dominar isn't anything like the retro Royal Enfields in terms of design, ability and purpose. 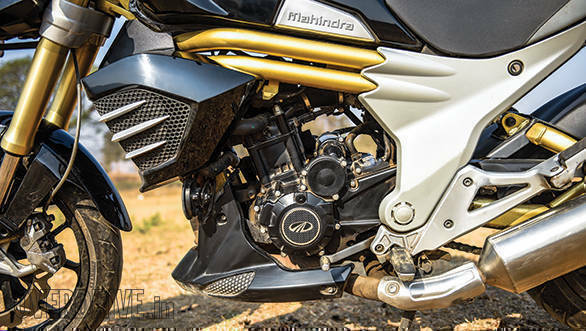 When you look for a real rival to Bajaj's 'power cruiser', only one motorcycle comes to mind, the quirky but likeable Mahindra Mojo. 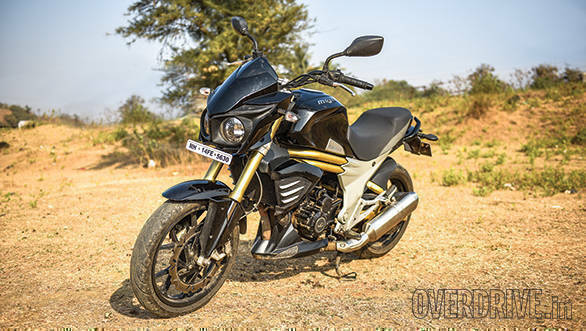 So how does the latest Bajaj fare? It certainly does a good job in the looks department. The Dominar has a mature, cohesive design that's far easier on the eyes than its faired cousin, the RS200. The bike has a nice stance with a powerful full-LED headlamp, muscular body work and a clean tail section. Fit and finish is the best we've seen on a Bajaj yet, and so far we've come across no offensive squeaks or rattles. The Dominar gets new switchgear that feels more premium and nicer to use. Still, a simple low/high beam switch for the headlamp would have been easier than the confusing two-switch, four-setting system. Handsome it certainly is, but the Dominar suffers slightly for its resemblance to the NS family. It simply doesn't attract as much attention as some owners would like. The Mojo is the exact opposite. The funky, oddball lines wrap around what is a serious large machine. Factor in the dual headlamps and twin exhaust pipes and you have a bike that looks like nothing else. Even today, nearly two years down, the Mojo still turns the same heads that look past the fresher Bajaj. The Mojo here used to be our long-term bike and it's impressive to see how it has aged. Despite being run hard its entire life, there are almost no rattles or loose body panels to show. It's not perfect though, and as we noticed earlier, finish in some places stands to improve. One example being the foot rest panel that gets completely scuffed by the rider's boots. 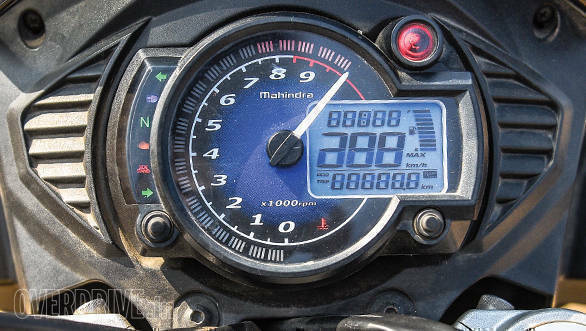 The Mojo has a tacky looking, but informative ana-digi instrument cluster. 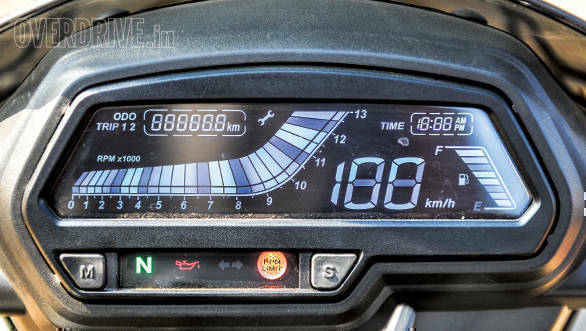 The Bajaj's fully digital unit looks nicer but doesn't show as much data. However, we did notice that direct overhead sunlight makes it hard to read. Ride the Dominar and a Duke 390 back to back and you'll find it hard to believe one is based on the other. The Dominar has a much calmer nature with a strong mid range and nothing much to offer north of 8,000rpm. 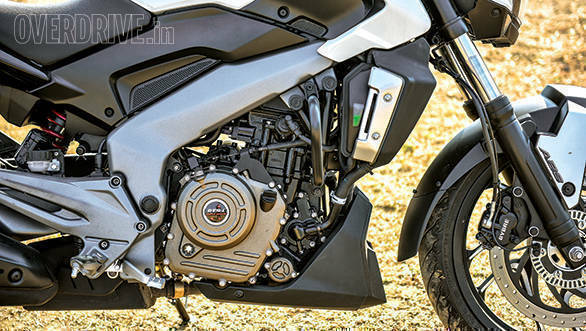 The Bajaj uses a simpler SOHC valvetrain to make space for its three spark plugs. Power and torque figures are respectable at 35PS and 35Nm, which makes the Dominar considerably more powerful than the Mojo. The engine sounds smoother than the KTM's at idle and produces a similar but deeper sound to the NS and RS200. Also similar to the NS is the raw, thrashy sound and feel on the move. The real issue, however, is the vibration. The bar and pegs have some level of vibration in them at nearly all engine speeds. Up to about 4,500rpm, the vibes are fairly minor but they get stronger above. This is a pity because the Dominar engine is capable of comfortably cruising at 110-120kmph all day long, but the vibes start to become an irritant at this point. 0-100kmph takes 8.1s and we recorded a top speed of 153kmph, but the Dominar runs up to 145kmph without too much effort. It is also pleasantly efficient, returning 38kmpl on the highway and 27.9kmpl in the city. One of our favourite parts of the Mojo experience is the engine, and this one is running smooth and strong even after 14,557km. The 295cc DOHC motor puts out 27.2PS and 30Nm. Performance is brisk with an 8.2s 0-100kmph run and a top speed of 142kmph. The Mojo is slightly less efficient, returning 35kmpl on the highway and 26.5kmpl in the city. In the real world, the Mojo offers nearly the same turn of speed as the Dominar but the sheer smoothness creates a sensation of less effort. Despite the power deficit, I found myself favouring the Mojo's engine thanks to its generous real-world performance and outright smoothness. Oh, and those dual pipes generate a much sweeter note than the Bajaj. Both bikes have a 6-speed gearbox, but the Dominar has lighter clutch action and more precise gear changes. The Dominar's slipper clutch isn't really necessary but most riders will appreciate the smooth downshifts it enables. You would expect it to be the engine but it's actually the Dominar chassis that shines brightest against the Mojo. The Bajaj has a firm but supple feel that translates to decent ride quality and surprisingly good dynamic behaviour. Ride quality is good for the most part but bad potholes will kick you out of the seat. 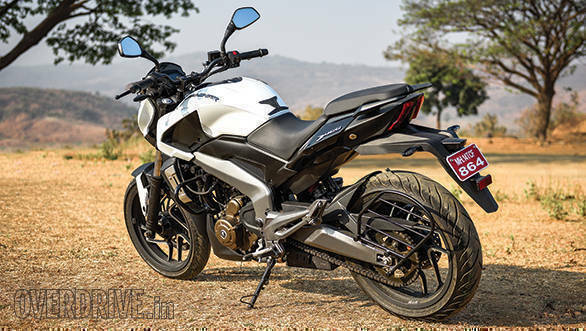 I'm actually a little surprised by how firm the Dominar is, and Bajaj has informed us that the production run will see bikes with a slightly softer setting at the rear. Unlike the unwieldy Mojo, the Dominar is a peach to ride around the city. It needs little effort to change direction and feels quite light on its feet while the Mojo demands to be muscled around. On the highway, things move slightly in the Mojo's favour thanks to its excellent ride quality that soaks up imperfections just that little better than the Dominar. The only downside is that the Mojo's soft seat gets painful after a few hours, and the firm flat Dominar perch does better in this regard. The Dominar's thin tail section may allow saddlebags to get a little too close to the rear wheel and the Mojo should offer better luggage-carrying ability. However, come the twisties and the Dominar shows the Mojo a clean pair of heels. Where the Mojo is a happy cruiser, on a winding road she feels tall, heavy and unwilling to change direction with haste. Cornering clearance is quite restricted too and the footpegs quickly begin to grind. No such issues with the Dominar. Her light-footed feel in the city translates to quick responses on the move. 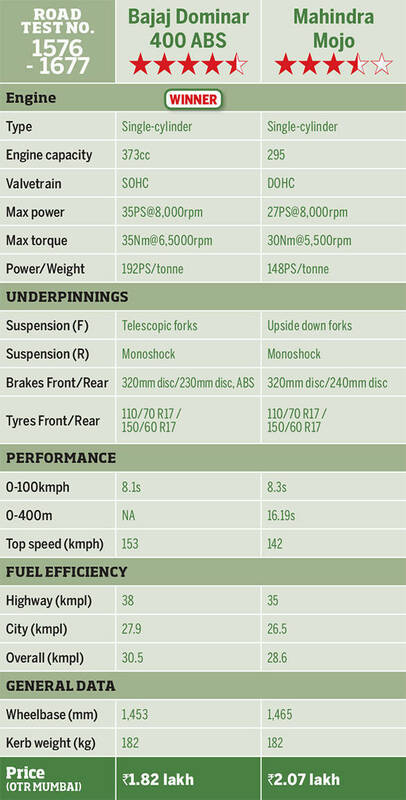 Cornering clearance is generous and the MRF Revz C1 tyres, while not as grippy as the Mojo's Pirellis, still provide high levels of traction. Even on the brakes, the Dominar offers more bite and feel than the Mojo which requires a strong pull of the lever and has quite a wooden feel. The icing on the cake is that the Dominar offers ABS while the Mojo doesn't. We've said it before and we'll say it again, the Mojo is a likeable motorcycle. The engine is a gem, ride quality is excellent and it offers a big bike feel that the Dominar can't match. What you can't see on paper is character and the Mojo, despite its flaws, is packed with the stuff although the flavour can be polarising. It's also proven to be reliable with no major issues creeping up. The Mojo doesn't sell in huge numbers but most owners are happy with the experience. Despite its virtues, the Mojo simply cannot stand up to the sledgehammer blow that is the Dominar's value proposition. At Rs 1.82 lakh on-road Mumbai, the Dominar ABS is Rs 25,000 cheaper than the Mojo. But it's not just the affordable price, the Dominar is packed with features and offers stronger performance, dynamics and better efficiency to boot. However, the vibrations cause us to stop short of professing pure love for the Dominar. Hopefully, Bajaj will manage to iron out some of it as production stabilises. We suggest a test ride to confirm that you're okay with the vibes before making a decision. Still, for this kind of money, the Dominar provides stellar, unbeatable value. This was originally to be a three-bike comparison; we even shot the other two with this Classic 350 that a colleague kindly loaned us for the story. 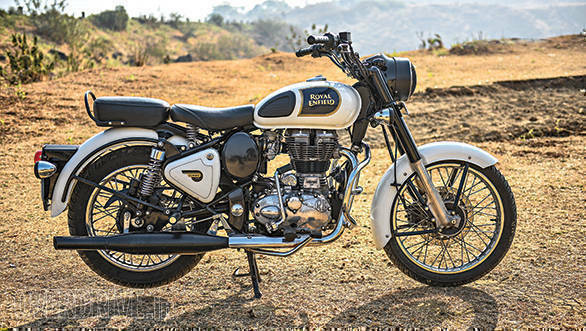 But it quickly dawned that the Royal Enfield is so drastically different that a comparison would be unfair. On a purely objective basis, the RE would score precious little against these two. Highway speeds above 60kmph produce serious vibrations, ride quality is decent, the brakes work, and the bike will turn when you ask it to, within reason, of course. Nothing to write home about then. But here's the thing, Bajaj and Mahindra are selling technology while Royal Enfield is selling an idea. RE isn't making any claims of performance, handling or the like. Instead, they're asking you to come live the Royal Enfield experience. Owning a Royal Enfield today is about belonging; it's about the clubs, the rides, the adventures and the brotherhood. It's taken Royal Enfield well over a decade of unwavering effort to build the brand into what it is today. So yes, despite the fact that the Dominar is a far more sophisticated machine, I doubt it's going to steal much sales from Royal Enfield. It's going to take a much stronger marketing push from Bajaj over a long period of time for that to happen. Till then, a Royal Enfield customer will remain a Royal Enfield customer. 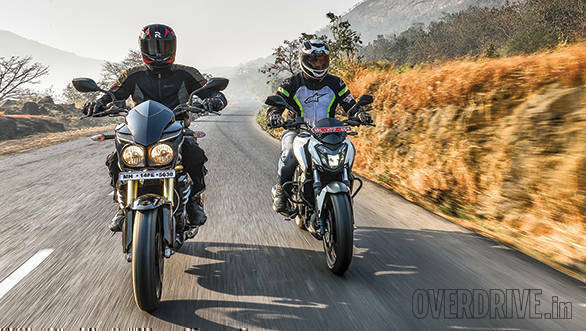 The Royal Enfield will, we believe, remain the top seller although the Mojo as well as the Dominar 400 are both better motorcycles.